﻿ Hyatt Regency Danang Resort and Spa, Da Nang | FROM $172 - SAVE ON AGODA! "The Hyatt Regency in Danang has everything for families - a..."
"The staffs are very kind and the facilities of the Hotel are good for the family activities." 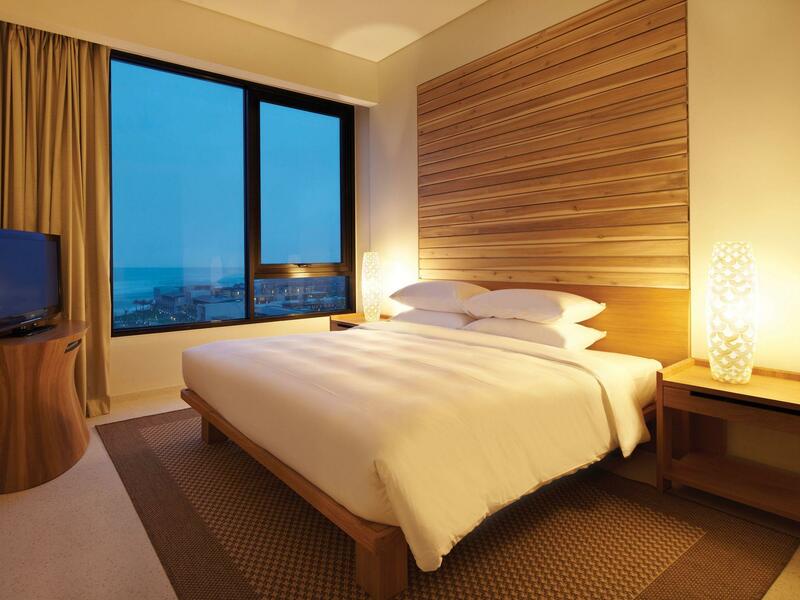 "Loved the room, spacious, beautiful wood paneling, lovely big bathroom and balcony." "Ther resort is great for family stay especially with kids as the resort offers many kid's programme." "Amazing views of the sea from the rooms." Well-positioned in Hoa Hai, Hyatt Regency Danang Resort and Spa is the ideal point of departure for your excursions in Da Nang. Only 13 km away, this 5-star hotel can be easily accessed from the airport. With the city's main attractions such as Tien Hieu Marble Handicraft Sculptures, The Marble Mountains, TY NGOC Handicrafts Sculpture Shop within close reach, visitors to the hotel will just love its location. 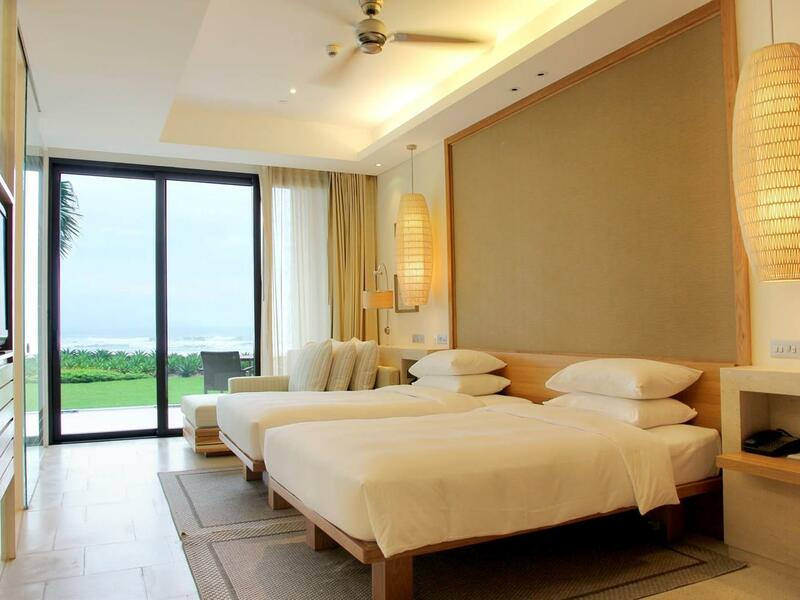 At Hyatt Regency Danang Resort and Spa, the excellent service and superior facilities make for an unforgettable stay. To name a few of the hotel's facilities, there are 24-hour room service, free Wi-Fi in all rooms, 24-hour security, convenience store, daily housekeeping. 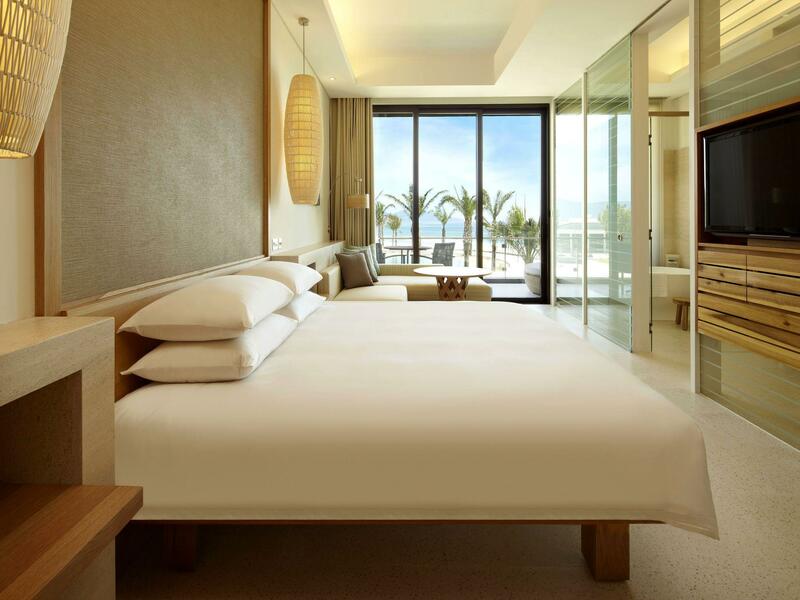 The ambiance of Hyatt Regency Danang Resort and Spa is reflected in every guestroom. television LCD/plasma screen, bathroom phone, carpeting, complimentary instant coffee, complimentary tea are just some of the facilities that can be found throughout the property. Throughout the day you can enjoy the relaxing atmosphere of the yoga room, hot tub, private beach, fitness center, sauna. 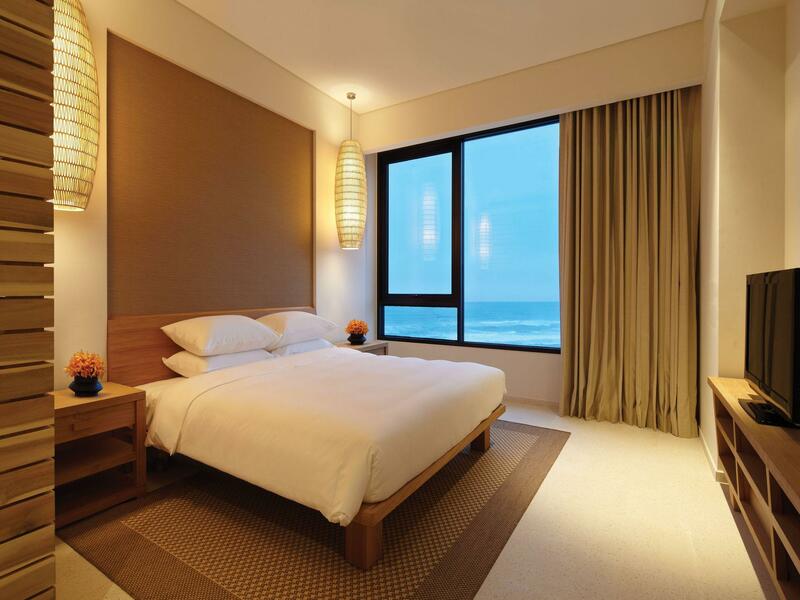 Hyatt Regency Danang Resort and Spa is your one-stop destination for quality hotel accommodations in Da Nang. "Great service with good club benefits." Please be informed that the hotel only accepts one child below the age of 12 which sharing beds with parents in one room. For room types: King Room, Ocean View King, Ocean View Twin, 1 Bedroom Residence, 2 Bedroom Residence & 3 Bedroom Residence: room rates are not inclusive of breakfast. Price of breakfast is charged at hotel at 22USD++ for an adult from 12 years old upward and children between the ages of 6 and below 12 breakfast is at 11USD++. For room types: Club Ocean View King, Suite and 3 Bedroom Ocean Villa: room rates are inclusive of breakfast. The property provides shuttle service to nearby areas. Kindly contact the property for more details. All hotel staff are very friendly and helpful. The hotel private beach is beautiful and is in the middle of the long coastal line. Breakfast is good. Taxi to Lang Ca seafood restaurant or Lam Vien Vietnanese restaurant is within 10 mins. Conceige has helped me hired a taxi for 7 hrs to go around DaNang at about USD40 which is nice. Staff upgraded my room to ocean view after I complained of the noise from the pool - nice touch. The view is great, love hearing the waves coming in from the balcony. The beach is so beautiful with nice soft white sand. The room is spacious and airy but wish they clean out the dustballs which is all over the hanging rattan lamps..quite horrible to be sleeping right next to dusty lampshades. Breakfast spread is good but the food over at the pool house is the best! So yummy! So awesome to be able to dine under the stars right next to the beach. A must-do! I like korean styl and People . But for evening no entertainment/ no bar / no music actually the staff very friendly but some don’t understand order . 5 star hotel not Realy because some on the menu was not available. Nice quiet place but after 2 days will be boring. It’s a huge 5-star resort by the beach. Amazing views of the sea from the rooms. But the rooms are getting a tad worn out , electric sockets have fallen out of the wall and are unusable. The breakfast at the Greenhouse is excellent though and the apartment that we stayed at was huge and comfortable. This hotel is luxurious and the rooms are very well done. The bathroom is huge. Love the view overlooking the ocean and vast surroundings of the hotel. Adequate kids club with staff that try their best to accommodate our requests and are good with kids. Some interesting activities arranged daily for the kids. There are 3 swimming pools available, all very big so no worries about crowded pools. Nice beach, though we went in March when the weather was quite cold ie. 20c. Good restaurant options. All in all, definitely recommend for a relaxing stay with the kids. Staff were very friendly especially 2 interns we met - Siti Aisyah from front desk at check in check out and Xulin at concierge assisting with taxi at resort entrance. Their smile and eagerness to be of service always approaching us to help. Nice resort with many facilities to keep the kid busy. Ther resort is great for family stay especially with kids as the resort offers many kid's programme. The beach is beautiful and the restaurants in the resort served great western and vietnamese foods, though the price is not cheap. 3 friends and I stayed at Hyatt regency for 1 night in a 2bedroom suites, it’s very spacious and with sea view, we enjoyed our stay there. The staff are very helpful and polite. Variety of food for breakfast; we had dinner at beach house, food is so-so but service and atmosphere were good. The hotel has lots of facilities and a few swimming pools around, can stay and chill at hotel for whole day, but just the spa was very full, a bit disappointing that we could not try. Overall, there’s no any store or restaurant nearby, it’s a good and cozy place for vacation simply staying at there. Beautiful resort with incredibly friendly, helpful staff. Our room was lovely and the beach was pristine . Nice restaurants and fabulous cocktails. The spa was AMAZING and Van was a perfect massage therapist! 5-star luxurious hotel, everything expected with high quality and price. Beautiful beach, comfortable room and plenty of choices for breakfast. Not satisfied with service of waitress for breakfast, they don't clean guests' used plates even they are piled up like a tower! I stayed in 3 bedroom residence. View was great, room condition was good. Threre were several pool kids and adults can enjoy together. Private beach was very popular spot to my children :) Breakfast was great with various fresh fruit. Generally it was very recommendable. The resort was superb! The beach was beautiful with amazingly soft and fine sand. The resort had a good number of pools to choose from and if you had young kids, there is a pool with a sandpit for the kiddos! The daily breakfast was yummy, however, it can get pretty crowded and while we were there, there was some confusion over the queue to get into the restaurant for breakfast. This could have been better managed as some of us were left waiting for quite a long time as we were missed out. Food from the various restaurants located within the resort were good too. A good experience overall. The Hyatt Regency in Danang has everything for families - a gorgeous beach, nice swimming pools (x 5), a good gym, ample choice of restaurants. Staff were professional and courteous, especially our very helpful concierge! We were always made to feel welcome, and were very happy with our stay. The resort is only 10 mins. away from the city, and there is a good choice of restaurants there, so you are not limited to the Hyatt. Hoi An is 30 mins. away and makes a good day trip. Overall, very happy and would come back to the Hyatt Regency. The room is spacious and have all you need for a true relaxing trip. It has a big balcony which can overlook the pool. One can enjoy a good bubble bath with the swimming pool view, too! It meets the great standard of Hyatt where service is very prompt and all staff are helpful and friendly. Swimming pools are of the right size for vacation. It has direct access to the nice long white sandy beach. One can enjoy the sunrise if the weather allows. Hotel has shuttle service to Hoi An as well but taxi is very easy around in Danang and Hoi An. The location is fantastic being about 10 mins from Da Nang and 30 mins from Hoi An. Hotel and facilities were good. I thought the breakfast buffet was a little average in their selection. The staff try their best but could do with additional training. Service standards are not like what you would get in other similar hotels in the region.